A native Ohioan, I live in a very unique part of the state – the crossroads of Cleveland and Pittsburgh sports fandoms. I’m pretty much obliged to like football even in a passive way, so I choose the Steelers. But with the lockout and the idea of a shortened or non-existent season looming, I have latched onto another sport that’s more exciting: hockey. Emma was the one who introduced me to it via her Thrashers, and from there I gravitated not toward the Penguins or the Columbus Blue Jackets, but the Chicago Blackhawks. I love my boys and other boys from various teams. I also love hockey fights, and I tend to not breathe during the third period. Em and I share the same interests, although I must add crocheting to the list. We are learning this sport together, and I can’t think of a better person to be with on this ride. Someday (depending on finances and game schedules), the two of us will take a road trip to Pittsburgh to see the Pens play, and it will be the most awesome trip in the history of road trips. P.S. Patrick Kane is my all-time favorite player, followed closely by the awesome Mario Lemieux. At 22, I’m the same age as many of the players I like, which is pretty interesting. I was born in and live in Atlanta, Georgia. (Well, okay, in Decatur, but that’s just east of Atlanta and is part of the sprawling metro area.) After a lifetime of not caring about sports except for a passive “yay, go home team” whenever an Atlanta team made it far in the playoffs, in January 2011 my friend Amanda convinced me to go with her to an Atlanta Thrashers game. It was against the Washington Capitals, 1-0 Thrashers, shutout earned for my favorite player ever thankyouverymuch. Maybe that night Amanda didn’t know what kind of a monster she’d just created, but since then I’ve been eagerly learning more and more about this sport and the various aspects of it. I’m a journalist by trade. I’m also interested in the news, politics, watching perhaps far too much TV, eating various kinds of food, many kinds of music (including rap; hey, I’m from Atlanta, we produce good stuff here) and random funny stuff on the Internet. This blog will showcase my journey as I go from just being a faithful Thrashers fan to figuring out which teams to like (part of it is conditional on where some of my favorite Thrashers will go in the fall), as well as a place for me to just talk shop and also showcase good-looking talented guys because I’m a red-blooded heterosexual woman, after all. Also, I look like this. 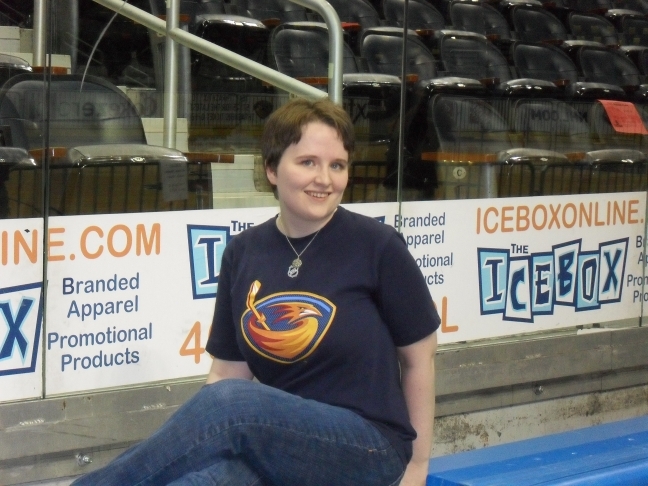 Yes, that is me in my Thrashers ‘shersey’ (it’s Ondrej Pavelec) on the bench at Philips Arena. Blueland forever. My favorite player? Ondrej Pavelec. I’m predictable. Second to him? I have to choose? Well, I certainly gotta admire Tim Thomas’ talent.